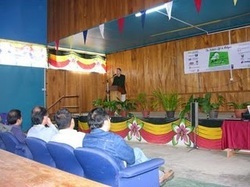 Conferences, workshops and seminars are regular features of international development practice. Many development projects are automatically wound up by such an event in which project participants share project experiences and promote the outcomes to a wider audience. Nowadays, I get invited to one such gig on average once a month, either to contribute my own experiences or as an opportunity to learn from those of others. Whilst it is always useful to connect with colleagues and to learn from them, the style of such events, along with the style of many other development practices, often leaves me feeling uncomfortable. It seems there’s money in poverty nowadays, and I’m concerned how much of it doesn’t actually percolate down to the poor. I have long been rankled by conferences, workshops and seminars about poverty reduction that take place in luxurious surroundings – city-based 4 or 5-star hotels and conference centres – with no poor people in the room. Have you ever thought that the money spent on such events could be put to better use by helping to achieve what the participants are actually discussing? Development Conferencing turns the popular conference model on its head; by taking the pundits to the rural places and people they are talking about and mixing them together in the same room (most Asian poverty is rural). Everyone benefits from this. The practitioners, professionals and academics get a taste of rural poverty; for some of whom this may be a rare experience, and the poor people themselves (‘beneficiaries’ or ‘subjects’ as they are known in development parlance) get to hear how decisions that might affect them are made, something that is equally rare in development practice. Additionally, the money that goes into organising the event; the cost of accommodation, lodging and conference facilities, goes into the local economy instead of into the coffers of the hotel corporations, thereby contributing to local development. Another significant benefit arises in the form of cost savings for the organisers as local rural facilities cost less than the conventional city-based conference venues. Whilst access to the location for the outside visitors may present some challenges, the benefits will make the extra effort worthwhile. Actually, travelling to attend a conference is a form of tourism. MICE Tourism refers to Meetings, Incentives, Conferences, and Exhibitions. It is a particular type of tourism in which groups of people are brought together for a particular purpose; perhaps to share knowledge, promote their products or just to enjoy the junket. The term Pro-Poor Tourism has emerged as a mechanism for ensuring a larger proportion of tourism revenue is earned by the poor residents of popular tourism locations; something that is not an automatic outcome of the growth of global tourism. Similarly, Community-Based Tourism is a type of Pro-Poor Tourism that is operated by rural villagers themselves whereby visitors stay in the households of the local residents, share in their daily lifestyles, enjoy the rural environment and learn about the local culture. So why not pro-poor MICE as a form of Community-Based Tourism - something that you might expect would be of particular interest to people working in poverty reduction? A recent example illustrates the concept perfectly. 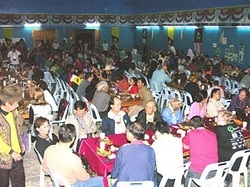 The e-BarioKnowledge Fair held from 6-8 December 2007 was held in the remote and isolated village of Bario, in the Malaysian state of Sarawak, on the island of Borneo. 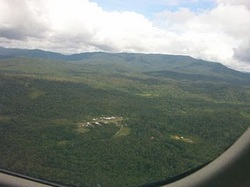 Bario is a fly-in community of around 1,000 residents; there are no roads leading there and access is by a one-hour flight in a 20-seater Twin Otter from the coastal town of Miri. Nestled in a valley at 1,000 meters above sea level in the Kelabit Highlands, Bario is the heartland of the Kelabit people, one of Malaysia’s smallest groups of indigenous ethnic minorities and is surrounded by mostly pristine rain forest, including a newly gazetted national park. E-Bario is a pioneering project that brought computers, telephones and the internet to this hitherto isolated community. Bario is also a Community-Based Tourism destination; where visitors can enjoy the pristine rainforest environment as well as the unique culture and warm and hospitable nature of the Kelabit community. The e-Bario Knowledge Fair was instigated as pioneering example of Development Conferencing. Its purpose was to bring together development professionals, academics and activists to share the experiences of the e-Bario project and its impact on the Kelabit community. It also incorporated a Workshop on E-inclusion and Media for Asia’s Indigenous Peoples, organised by the Regional Centre in Bangkok of the United Nations Development Programme. The purpose of the Workshop was to bring together individuals working for the betterment of Indigenous Peoples around the world and to formulate proposals for using the Media and Information and Communication Technologies to accelerate development for Asia’s Indigenous Peoples. Bario provided the perfect context for such an interaction as the e-Bario project has delivered considerable benefits to the immediate community as well as to the wider Kelabit people. The Knowledge Fair brought together more than a hundred participants from 15 countries. Academic presentations of relevant research were mixed together with presentations from the residents and from the wider Kelabit community and in the presence of the overseas participants. 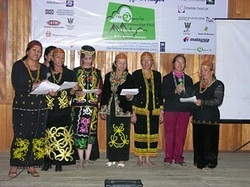 The discussions resulted in a programme for further development of the e-Bario project; including plans for a community radio, a local telephone service and a community network to extend the reach of telecommunications further into the Highlands, to less accessible communities and even across the border into the neighbouring states of Sabah and Indonesian Kalimantan. E-Bario now intends to become the hub of a communications network that will serve the heart of Borneo and it now has a global network of friends and associates willing to provide assistance. An example of this emerged within just a few days of the Knowledge Fair when Professor Heather Hudson, a world renowned expert on village telecommunications, long-time friend of e-Bario and keynote speaker at the Knowledge Fair, caught the attention of the Malaysian Minister of Energy, Water and Communications at the 3rd Global Knowledge Conference in Kuala Lumpur the week after. Professor Hudson suggested that the regulations should be modified to allow e-Bario to develop into a communications hub, with the help of the Government’s Universal Service Fund, as the project has already demonstrated its capacity to deliver a desirable service and no other commercial operators were willing to operate in such a remote area. The Minister responded publicly with a promise to review the regulations regarding the fund and to visit Sarawak to better understand how it can be used to ensure improved communications services can be delivered to the largely remote and isolated communities there. A further notable outcome of the Knowledge Fair is the e-Bario Vision for Indigenous Peoples, which was formulated as a response to the recent adoption by the United Nations General Assembly of the United Nations Declaration on the Rights of Indigenous Peoples. 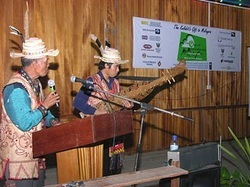 Whilst the Declaration contains a clause regarding the Media and Indigenous Peoples, there is no reference to their rights of access to information or to Information and Communication Technologies (ICTs), which was seen by the Knowledge Fair participants as a lost opportunity given the beneficial impact of the e-Bario project and the many others like it with which many of those present are involved. The e-Bario Vision for Indigenous Peoples foresees a world in which all Indigenous Peoples everywhere, irrespective of location, are able to make full and effective use of new media and ICTs towards the common goal of self-determination. 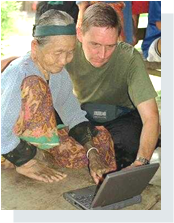 In acknowledging the example of e-Bario and the many similar projects that exist world-wide, the Vision recognises the need for widespread development and deployment of contemporary and future ICTs and new media for the realisation of creative and effective solutions for the problems faced by Indigenous Peoples. The final reason that makes the e-Bario Knowledge Fair important is because it exemplifies the concept of development planning as a development process. The participants were walking the walk as well as talking the talk, and they, and their hosts, felt good about that. It was important that they met there, in Bario, as opposed to meeting in a homogenous banquet hall in an equally homogenous hotel or conference centre. Development Conferencing is a form of development planning that takes place at the locations that it affects. It also takes place with the people that it affects being involved, or in the case of Bario, actually running the event. Accordingly, Development Conferencing, when done properly, contributes immediate benefits to the local economy as well as fostering long term benefits from the outcomes. It engenders empathy among the participants with the issues being discussed and it promotes equality in participation with the residents of the location, which in turn ensures grass-roots input. Many of those I have worked with in rural development over the last ten years or so will have heard me on occasion complain about those development professionals who ‘never get mud on their shoes’; referring to the army of desk-bound city-based pundits who seem able to download a few reports (‘knowledge products’ in development speak) off the internet and turn themselves into experts overnight without actually getting out ‘into the field’ (another development-speakism) where the knowledge is actually created and put into effective use. It’s safe to say that no-one at the e-Bario Knowledge Fair could be accused of falling into that category, either figuratively or factually. Call it “Development Conferencing” or “Pro-Poor MICE”, the event in Bario demonstrates how desirable benefits can arise from such an approach. I commend it to development practitioners who are equally concerned about the amount of development money that fails to reach its targets and who wish to enrich their activities with a taste of reality.